This is a sport sequence I captured in January this year. The multiple frames you see came from shooting at about 7fps. 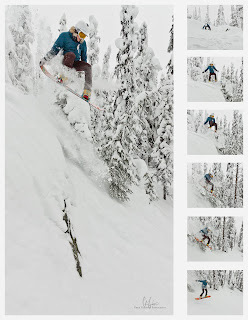 We get so much flat light at Big White, it often drives you into the trees - sounds dangerous in low visibility? Actually trees give you depth perception so that you can begin to see the changes in terrain before you, that you wouldn't normally see in low visibility, flat light, on bare slopes. And fortunately that's how you stumble upon nice drops like this one. I used an ultra wide angle lens when I shot this, at full-wide, so I am actually very close to the action. I did this because it would mean I have to pan less in order to keep Morgan, the athlete, in the frame, but also have him take up a larger portion of the frame. It also affords me a view of takeoff and landing in the same frame, so in theory, I didn't really have to pan. Also it's a bad idea to change in flat light, low cloud cover weather anyways, so it's what was already on my camera for the day. Because I knew my subject was moving pretty fast I kept my shutter speed in the 1/1000 of a second area. Even though it meant boosting ISO due to low-viso weather, I don't want a blurry athlete in this shot. Besides, when you expose properly, even when boosting ISO, you won't introduce any noticeable noise until you get really high up there. 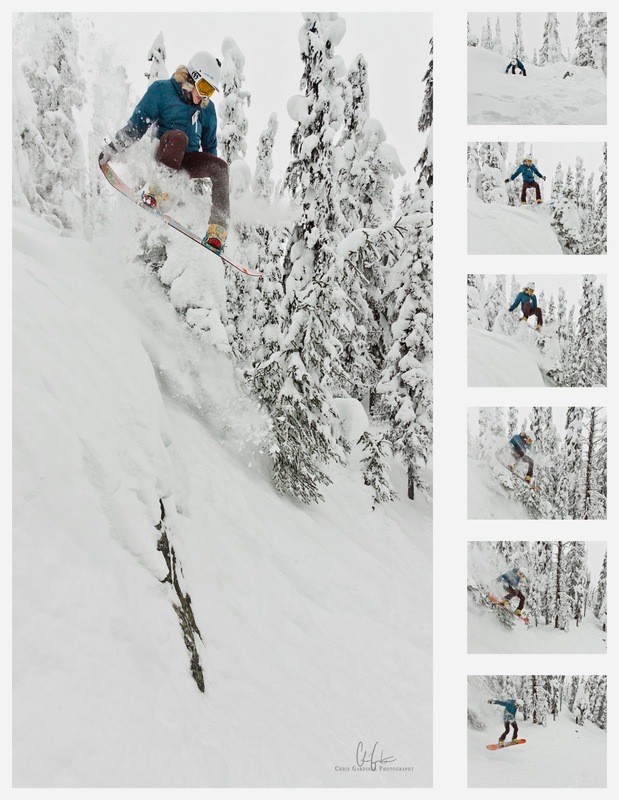 I am getting pretty stoked to capture some more winter sport photos this season!